Catherine Adams, a Yoga Teacher in London, wanted to create a unique space where she could grow her home yoga business. She chose to develop an outdoor studio where her clients could enjoy privacy and a peaceful setting. We had used The Garden Escape several years ago to build a studio at another property in Oxfordshire. We were really pleased with the results and I knew their style would suit my back garden. I researched other competitors but ultimately felt more comfortable with The Garden Escape product and service. What are the biggest benefits you’ve noticed, both for you and your family? The outdoor studio has become a base from which I can grow my home yoga business. I am running several classes a week and all of my clients love the space. 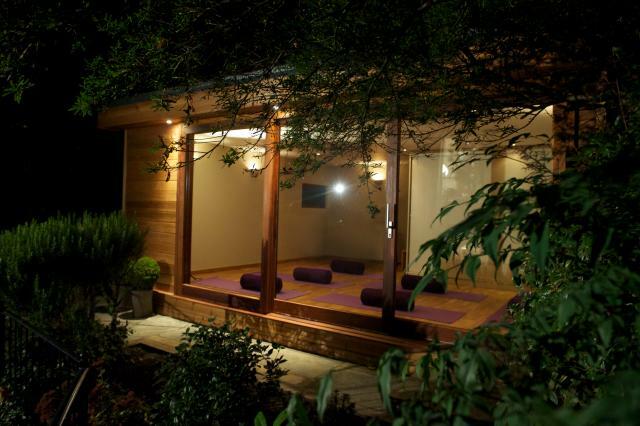 The garden setting is inspiring and very conducive to practicing yoga and meditation. Even in the depths of Winter and with the high volume of glass doors and panels, the studio is warm and inviting. It is very well insulated and the underfloor heating has provided all the heat I need. Having the outdoor studio separate from my house helps me balance my business and home life. Once classes are over I can shut the door on the studio and return to family life – without a commute. The build team were fantastic. They worked efficiently and they were polite and tidy, we barely noticed they were there. They did not slack or take long breaks and they stayed focused on the job from the very beginning to the final result. We were really pleased that we chose to use The Garden Escape again. The build team have created a unique environment in which my clients and I can practice yoga and meditation.